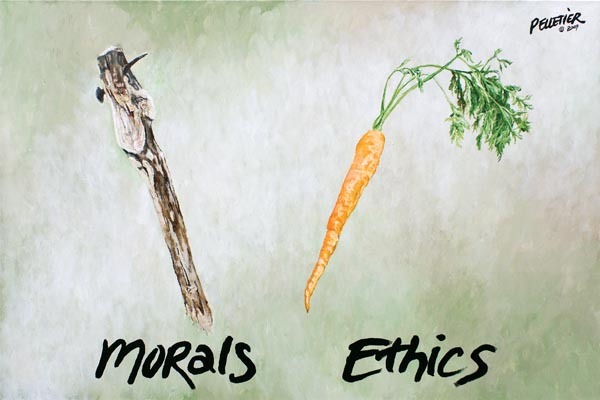 Today, I’d like to write about the difference between the words “ethical” and “moral”. The adjective “ethical” refers to a set of principles which state what kind of behavior is good. The adjective “moral” also refers to the idea of good behavior but is less formalized. The word “moral” focuses on a personal or societal judgement about what is right and wrong. Let me give you some ways to use these words in sentences. That company’s policies are very ethical, so I respect them. That company uses cheap labor in foreign countries to manufacture their products. It’s not illegal, but I don’t think it’s ethical. Many of the business practices ABC Company uses aren’t ethical. For example, they don’t pay for overtime but force their employees to work very long hours. My parents are very moral people. They always taught me to be honest and never cheat. Some people think stealing is ok if you help poor people with the money, but I still don’t think it’s moral behavior. My friend cheated on his test. Should I tell the school about it or stay loyal to my friend? It’s a real moral dilemma for me. So, as you can see from my examples, the word “ethical” is often used in business situations, and the word “moral” is often used to talk about people’s personal behavior. Please note that the opposite of these words is “unethical” and “immoral”. We can also say “not ethical” and “not moral”, but this is a little weaker. Generally speaking in English, words like “unethical” and “immoral” are very strong. It’s important to note that being “unethical” is not the same thing as being “illegal”. Many business practices are legal but not necessarily ethical. My second sentence is an example of this. Thanks for your explanation that is a lot help for me to understand.